Denbies Mansion was the centre of life on the Denbies Estate at Ranmore and provided employment for dozens of men and women, as well as homes for them and their families in cottages and staff quarters. The Cubitts used much of their energies and wealth nurturing their self-sufficient “Model Estate” of flint-faced Estate buildings. 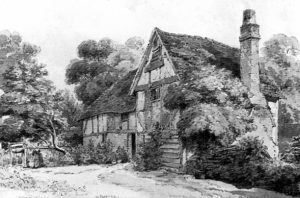 They maintained traditions such as the Harvest Home, cricket matches between the Estate and local villages (at which Maud, 2nd Lady Ashcombe, kept the score seated in her own private tent beside the ground), the endowment of Dorking Cottage Hospital and, above all, the patronage of the richly ornamented Victorian “Early English” St Barnabas (“the Church at the End of the Garden”), its adjacent School and Rectory. Click here for a Sketch Map of Ranmore Common, showing approximate positions of the various Estate buildings, farms and cottages, and their relationship to Denbies House, St Barnabas Church, Rectory and School. Westwards from the Mansion, near the junction of Ranmore Common Road and Ranmore Road, was the Dispensary where twice a week doctors from Dorking or Bookham visited to attend the Estate employees and their families. The Dispensary was also a school to teach the daughters of the Estate workers how to be domestic servants in a great house. There were usually four students (some of them sisters of men on the War Memorial) being trained there under the supervision of a Matron. 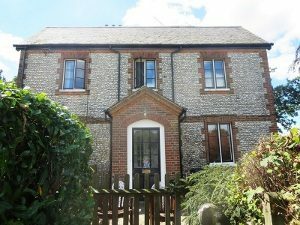 After a year the girls were kitted out with uniforms and either absorbed into the Denbies household or found good situations in other big houses. This road junction of Ranmore Common Road and Ranmore Road (which descended into Dorking) was called Snook(e)s Hatch. Here a gate prevented grazing cows from leaving the Common. At the junction was the General Stores where Stephen Tallents, grandson of George, 1st Lord Ashcombe, bought bullseyes in the 1890s/early 1900s. In summer the shopkeeper also ran a Tea Garden for visitors to this beautiful area. Later, the Stores also served as a Post Office. Before the Post Office opened, the postman had to come up from Dorking. One snowy day he lost his way on a track to a remote cottage, and was found the next day frozen to death. In Post Office Valley, which ran down the hill behind the building, a charcoal burner camped each summer. For these few months, his numerous children attended the School and any babies born were baptised at St Barnabas. Such a vast estate had many farms. At the western end of Ranmore Common were Hogden Farm and Ranmore Farm (where the beef herd was kept). Some of the men whose names are on the War Memorial lived with their families in the cottages by these farms: Pigden (Ernest Bradley), Stoney Rock (Fred Buckland), Garlic Cottage (George Royal, who survived), Bakehouse, and Golden Ring Cottage. Deep in the woods was Lonesome Cottage, home of the wheelwright and his family (including his son Edward Gale), and conveniently not far from the woodyard which was where the Scouts’ campsite now is. 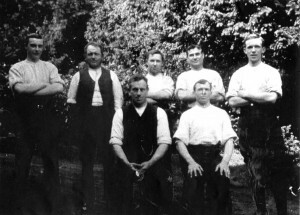 In the 1930s Leonard Overton, the then wheelwright and Estate carpenter (see “Men with 20 years’ Service” photo below) had a workshop at that end of the Common near the area called the Roundabouts; Dobinson the Estate joiner (see the same photograph) worked near the House. Henry, 2nd Lord Ashcombe was very keen on maintaining the woods and, according to Estate worker Jack Hills, could spin an axe as well as any woodman. After the Roundabouts came an area known as the Spains; to the east of this was Fox Field and the “Fox” public house where the Cherry Fair was held annually in July (now revived by the parishioners of St Barnabas). When the pub became dilapidated, new premises known as Fox Cottage were built. There are, somewhat confusingly, other houses also called Fox Cottages on the opposite (northern) side of Ranmore Common Road, one being the boyhood home of the WW1 casualty Albert Ansell. Near the “Fox” pub was the Fox Pond, at one time deep enough to a horse to swim. This may be the pond in which the School logbook says, “one of the school children seven-year-old Frederick [George] West accidentally drowned on Sunday 11th August 1892”. Young Fred was buried at St Barnabas on the 19th August. Further east along Ranmore Common Road were Rose Cottage (home of Isaac Luff who served in World War 2) and Lime Tree Cottages, one half of which was the 1911 home of two brothers of Albert Ansell of the War Memorial: George, a gardener, and Alfred, an electrician. In the other half lived Arthur Carr, the chauffeur in the motor car on the Denbies Estate page. Near the Post Office at Snookes Hatch the road forks: the righthand track (now called Ranmore Road) descends to Dorking, passing West Cottage, the oldest cottage on Ranmore. For a while after 1910 West Cottage was the home of Estate bailiff Allen Baker whose sons Ernest Richard and Edward George served, respectively, in WW1 and WW2. Edward George, RAF Volunteer Reserve, was killed and is remembered on the War Memorial and on a plaque in the churchyard. 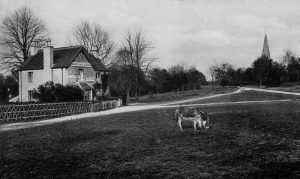 From Snookes Hatch, the lefthand track (now part of Ranmore Common Road) passes St Barnabas Church, the School and the Rectory, the gates of Denbies House, and North Lodge (home in 1911 of John Ansell, gardener and brother of WW1 casualty Albert Ansell). Then Ranmore Common Road turns sharp left to descend the steep hill on its way to Bookham and Westhumble. 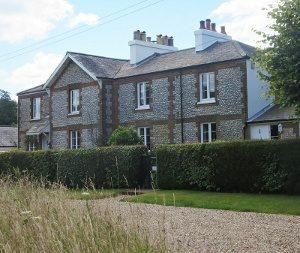 After another sharp (right-hand) bend, it passes Keeper’s Cottage, in 1911 the home of James Smallpiece, the senior gamekeeper, and by the 1930s of his successor Arthur Walder. 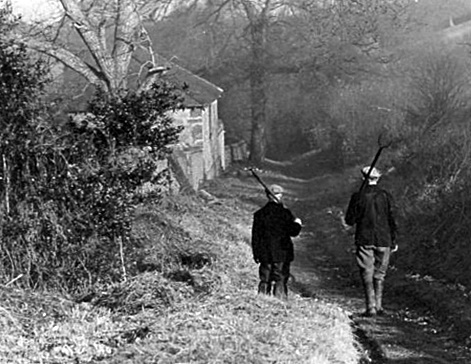 In the 1970s Walter Hitchcook, Estate Bailiff and former gamekeeper, was living there in retirement with his wife. Further along this track was the Fort (one of a chain of lightly fortified forts along the ridge of the chalk downs). Abandoned in 1905, it was used as two dwellings and a grain store before being demolished in the 1970s. 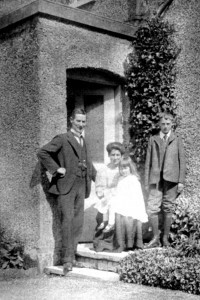 George Bradley (brother of Ernest of the War Memorial) lived in part of Fort Cottages in 1911 with his wife and a lodger, Walter Hitchcock, then under gamekeeper). 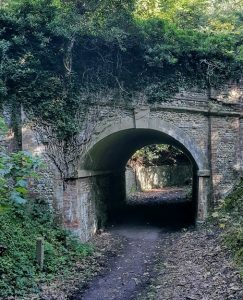 At the end of the road was Ashcombe Cottage where the track descends the steep, wooded hill as a narrow, flinty footpath. One might wonder why a simple Estate cottage (where Richard Ansell, the Estate foreman, lived in 1891, and Arthur Walder, gamekeeper, in 1911) was built of impressive Bath stone like the nearby church. The Estate had several lodges and drives. 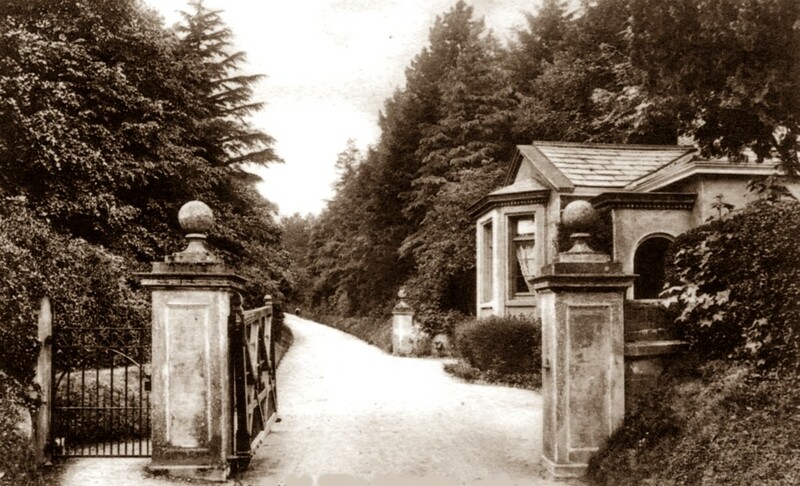 As well as North Lodge (see above), there was the main London Road Lodge north of Bradley Farm serving the principal access road to the Mansion (the Mickleham Drive, now called “Denbies Drive” and part of the North Downs Way). In 1911 the “Carriage Drive Manager”, John Edmund Monk, lived in this lodge with his family (in WW1 one son was a prisoner of war). 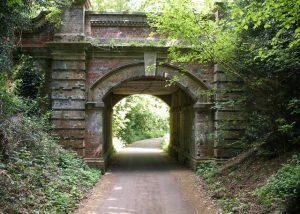 In the 1930s the lodge was demolished for the widening of the A24; a replacement was built, near the bridge carrying the London South Coast railway over the drive (photo right). 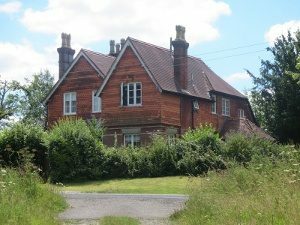 The lodge on the Ranmore Road was called (variously) Denbies Lodge, Westcott Lodge or South Lodge (photo below). From there, South Drive led westwards for about a mile until at a sharp hairpin bend it joined and merged with West Drive (which had started at Hole Hill just north of Westcott). This dogleg junction is below the scarp slope of Steers Field (also called by the National Trust “Denbies Hillside”). The Cubitts were obviously good employers and seemed to keep their staff and workers a long time. 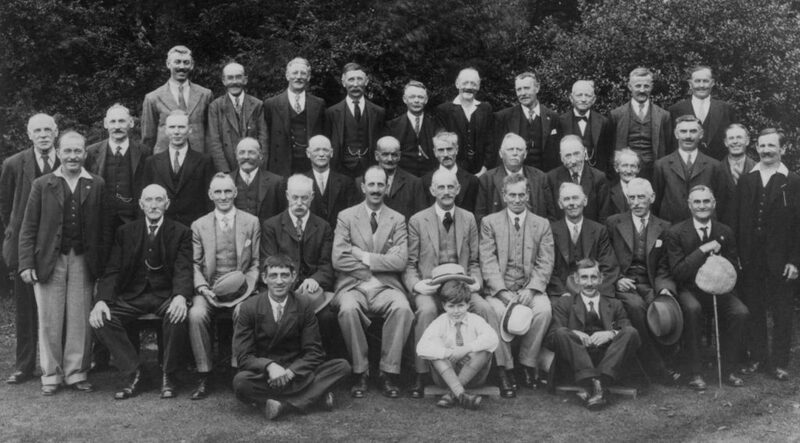 The photograph below, taken at a Harvest Home in 1934, shows men with 20 years’ service on the Estate, surrounding three successive Lord Ashcombes. A copy of this photo seems to have been owned by every family on the Estate. 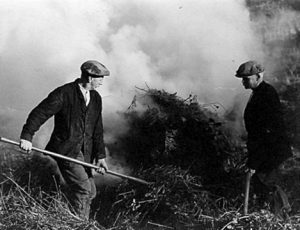 George Royal (right) and Fred Hodgkinson in Hogden Lane (Ranmore Archive).